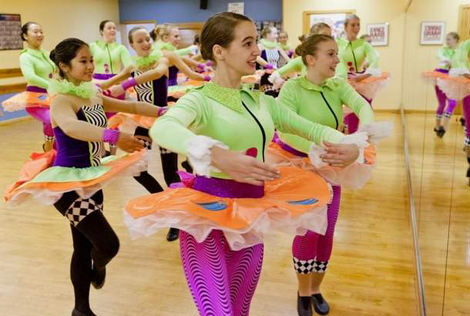 Dancers from a Village of Lansing school go prime time at this year’s Macy’s Thanksgiving Day Parade on Nov. 28 in New York City. Twenty dancers from the Armstrong School of Dance will perform with the Spirit of America Performance Dance Team alongside 600 other dancers. They will march the 2.5 miles through Manhattan and perform at Herald Square in front of Macy’s Department Store on 34th Street. The parade will be televised from 9 a.m. to noon on NBC. “I’m so excited for these girls to have an opportunity that takes them beyond Ithaca and puts them in a pool of dancers from around the country,” said Karen Gorsky, of Ithaca, head teacher and owner of Armstrong School of Dance. “It gives them more life experiences and through that they learn life lessons and that’s what I’m all about,” said Gorsky, who celebrates her 20th year in business. Life lessons include commitment, dedication as well as the payoff, she said. For parent Kristen Burt, of Lansing, those life lessons have given her daughter, Ashley, 16, a growing sense of confidence and independence. This year Ashley, who is dancing in the parade for a second time, is one of the older dancers and will be in a leadership position, she said. It’s also the sense of community involvement on a larger scale, Gorsky said. Last year, the troupe was invited to dance on the global stage in London at Piccadilly Circle on New Year’s Eve but had to turn it down because of travel costs. This is the third time dancers from Armstrong have appeared in the televised parade since 2008. Their troupe was spotted during a dance competition in New York City five years ago and were invited to participate in the parade by the Spirit of America team. 23 Armstrong Dancers Head to the 2016 Macy’s Thanksgiving Day Parade!